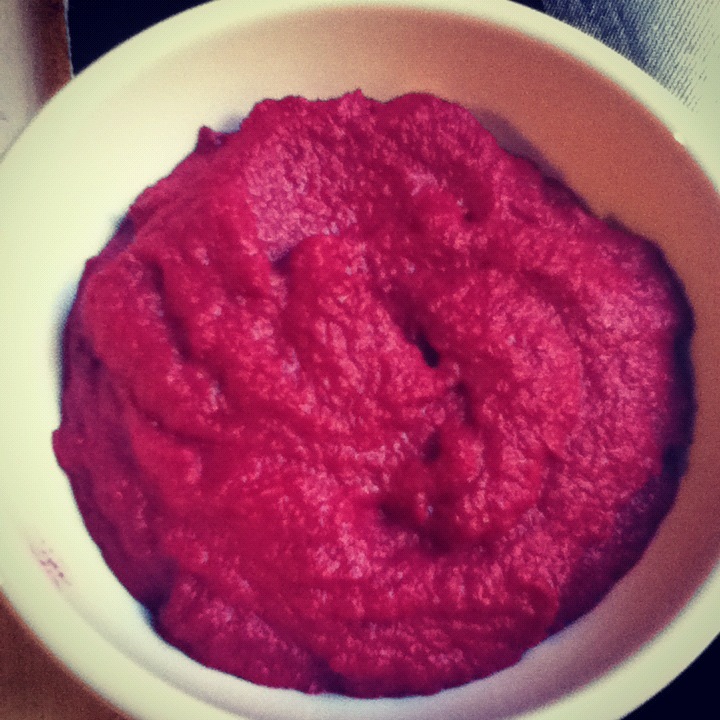 Bright pink and delicious – try this beet dip as an alternative to hummus. Made in my tiny NYC apartment, you can even see a bit of snow in the corner on the windowsill! Ah, February. The month of sub-zero temperatures, dark days and…love. While I try my best to avoid any restaurant serving over priced dinners for lovers throughout the month of February – I must confess, I secretly love making an extra effort in the kitchen on Valentine’s Day. After all, it is the anniversary of my first date (what pressure!) and many years later, my husband and I always make a terrific meal together and celebrate with a bottle of bubbly. Here are two beautiful recipes that I am making this week which will go very well with any Valentine’s meal. This makes a change from the traditional hummus dip. It turns out bright pink – perfect for Valentine’s Day! 1. Preheat the oven to 350°. Wrap the beets in aluminum foil and place in a roasting pan for about an hour or until tender. 2. Peel the beets by rubbing them with a piece of kitchen towel, cut them up and put in a food processor. Add the garlic and yogurt and pulse until blended. Add the olive oil and za’atar and puree. Season with salt. Scrape into a bowl. Scatter the goat cheese and more ground pepper on top and serve with raw vegetables or crackers. Delicious raw balls, full of protein and antioxidants to boost libido and make you look gorgeous! Place all ingredients into a food processor and blend until everything is mixed up and smooth-ish. Roll into balls, place in mini cupcake cases and refrigerate.